Located in Bergheim on the Alsace Wine Route, s'Harzala Vert offers self-catering accommodation just a 2-minute walk from the city centre. Free Wi-Fi, free private parking and a private entrance are featured. The apartment has a living room with TV and sofa and a fully equipped kitchen with coffee machine, oven and stove. The bathroom is complete with bath or shower. 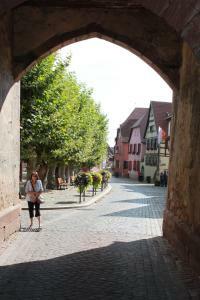 Guests can explore the medieval city of Bergheim and visit its gothic church or walk along its high walls. They can also drive 11 km to Sélestat or 18km to Colmar. The German Border is just 25 km away. This apartment features a living room with TV and sofa and a fully equipped kitchen with coffee machine, oven and stove. The bathroom is complete with bath or shower. Please inform s'Harzala Vert in advance of your expected arrival time. You can use the Special Requests box when booking, or contact the property directly with the contact details provided in your confirmation. A damage deposit of EUR 150 is required on arrival. This will be collected as a cash payment. You should be reimbursed on check-out. Your deposit will be refunded in full in cash, subject to an inspection of the property. Please note that bed linen is not provided but can be rented on site for EUR 10 per bed. Please note that a EUR 150 damages deposit will be requested upon arrival. This may be used to charge for any damages incurred to the accommodation during your stay. Please note that a EUR 40 end-of-stay cleaning fee is not included in the price. You can choose to pay the fee or clean the accommodation yourself.